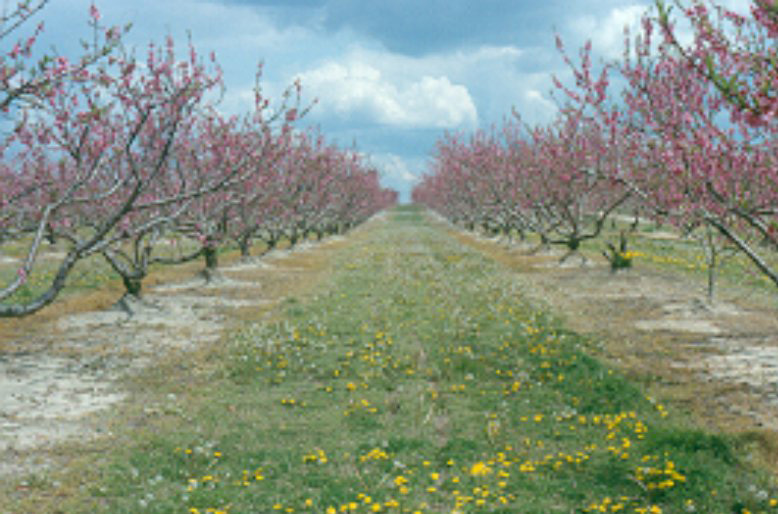 Managed sod row middles have many advantages, and have been adopted by many tree fruit growers. They provide a firm drive path for spring spraying of insecticides and fungicides, prevent or reduce soil erosion, and improve soil tilth by increasing soil organic matter. Broadleaf weeds in the sod should be controlled. Weeds are alternate hosts for insects diseases, and nematodes, and weeds in bloom can attract natural pollinators into the orchard throughout the spring and summer. Many insecticides warn against use when bloom is present in the orchard. Control dandelions and other weeds in orchard sod. Weed control in the sod should be completed in early spring or delayed until fall. Weeds are most susceptible to 2,4-D when they are growing vigorously, not under stress, and before flower buds appear. The herbicide must be applied BEFORE dandelions begin to bloom in April for maximum effectiveness. Apply Prowl H20 at 1 to 1.5 quarts per acre to control summer annual grasses that can weaken the sod, including crabgrass species, foxtail species, and others. WARNING: Use only 2,4-D formulation(s) labeled for use in orchards. Lower cost 2,4-D formulations are available but may be more likely to drift, may not contain a “low drift” agent in the formulation, are not labeled, and should not be used! BEWARE of herbicide drift! Grapes, many flowers, and vegetables are extremely sensitive to 2,4-D. Injury may occur in adjacent fields if sprayed when unfavorable conditions prevail. In apples and all stone fruits, add 3 to 4 fluid ounces of Stinger 3A per acre to 2,4-D to dramatically improve the control of white clover. Consult the Commercial Production Recommendations for rates and additional information.